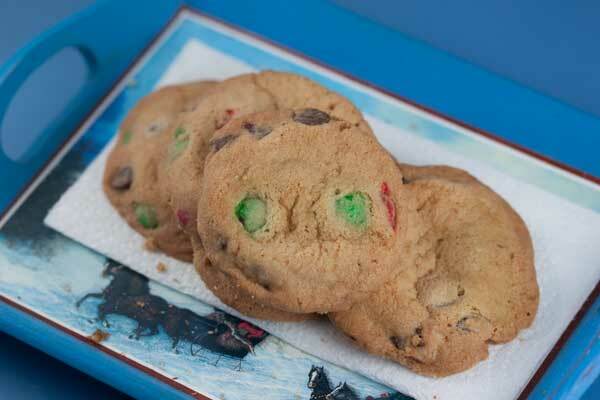 M&Ms Cookies made with dark chocolate M&Ms. This version uses the Christmas colored dark chocolate M&Ms, but you can use any color you want. Combine the butter and shortening in a large mixing bowl and beat until creamy. Add both sugars and continue beating on high for two minutes, scraping bowl. Beat in the vanilla and egg and beat until fluffy. Stir together the flour, salt and baking soda. Add this mixture to the sugar mixture and stir until mixed. Stir in the M&Ms and chocolate chips. Chill batter for about an hour. Drop batter by level tablespoons or rounded teaspoonfuls onto ungreased or foil lined cookie sheets, spacing 2 1/2 inches apart. Bake for 12-14 minutes. Let cool on cookie sheets for about 2 minutes, then transfer to wire rack to cool.